As many people across the nation await a decision by a grand jury in Ferguson, Missouri, on whether to charge police Officer Darren Wilson in the death of Michael Brown, MPR News is assessing how police are viewed in Minnesota. MPR News reporter Brandt Williams covers the city of Minneapolis and reports on the tensions that exist there. How are police-community relations in Minneapolis, the state's largest city? Historically relations — particularly between the police department and some African-Americans — have been rocky. There have been many instances where tensions rose over a police-involved shooting or some other high-profile clash between officers and black residents. Sometimes the outcry has led to the formation of task forces or sparked a series of community-based discussions between police officials and citizens. The first Civilian Review Authority was formed after an elderly African-American couple died in a botched drug raid back in 1989. However, the most common complaint among African-Americans about Minneapolis police officers is that they feel like officers are disrespectful to them. What are some recent high-profile incidents that have sparked tensions between Minneapolis police and the community? Last year, the shooting death of Terrance Franklin raised anger and suspicion by many people — not just in the African-American community. Police say Franklin managed to grab an officer's gun and wound two officers before the officers shot and killed him in the basement of an Uptown neighborhood home last May. The Franklin family's lawyer contends that the officers used racial epithets and killed Franklin when he tried to surrender. Earlier this year, an outspoken civil rights activist and critic of the police department named Al Flowers claimed he was beaten by officers who came to his home to serve an arrest warrant on his daughter. To many African-Americans — even those who don't necessarily support Flowers — it appeared that Minneapolis officers sought to get revenge on Flowers. Police say Flowers assaulted one of the police officers. Has a police officer ever been indicted in Minnesota for a shooting death of a suspect? Last year, MPR News asked the Hennepin County Attorney's Office for information on grand jury proceedings involving deaths that involved an officer — not just shootings. The office found data going back to 2000, and out of just more than 20 grand juries called to investigate police officers, none of the grand juries supported any criminal charges. How common are officer-involved shootings here? According to the state Bureau of Criminal Apprehension, there have been at least 52 people shot and killed by an officer in Minnesota since 2008. In 29 of those shootings, all but two of the officers were white. In the 35 shootings where MPR News has determined the race of the person killed, 22 were white, 10 were African-American, one was Hispanic, one was Native American and one was Asian. How diverse is the Minneapolis police force? Overall, 21 percent of the police force are people of color. African-Americans make up about 9 percent of the force — but make up nearly 19 percent of the city's population. 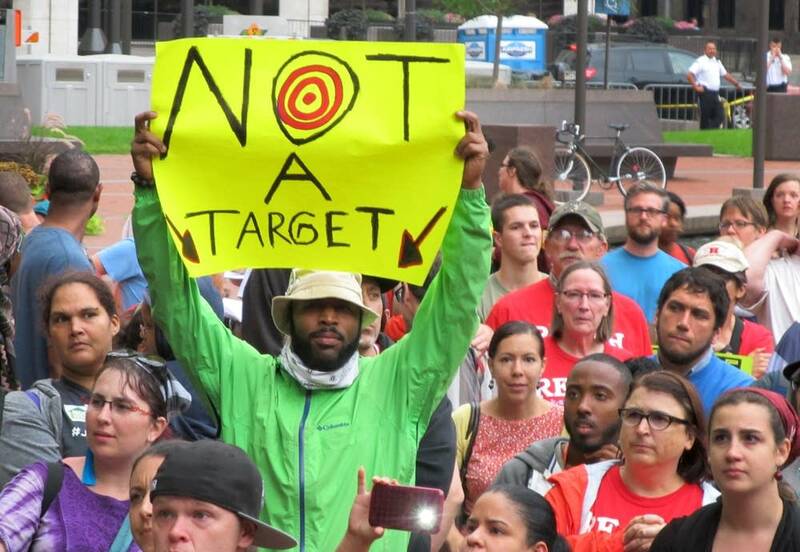 There have been protests in Minnesota over the shooting death of the unarmed teenager in Ferguson. Could there be more? Yes, two are scheduled for Tuesday — one on the University of Minnesota campus and one at the 3rd Precinct police station in south Minneapolis. Editor's note: The number of people shot and killed by officers in Minnesota has been updated to more accurately reflect overall fatalities as well as race.